This is my new bass. I put it together from parts I bought on ebay. I also refinished the body. I really like it so far. 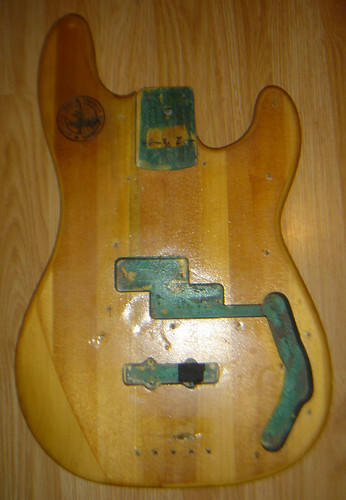 It is a Precision bass body with a P/J pickup set, wilkinson bridge standard jazz bass wiring and controls. The neck is a standard Jazz bass neck with Schaller tuning machines. I like the gold sparkle/metalflake paint and black pickguard. Here is the body before. You can see some more before pics and stuff in my flickr account.